What movies did you love as a kid? What can you remember watching over and over again? Are there any old movies that you show your children now? Do they share your appreciation, or do they prefer the new fare? I always loved watching musicals growing up. 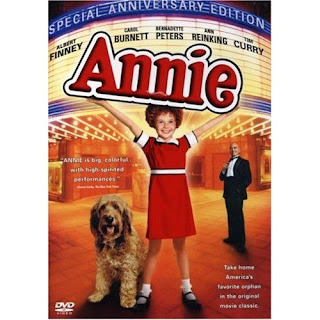 I especially loved Annie, and it's been fun to see my kids singing and dancing along the movie the way I used to. They are also fans of The Jungle Book and Mary Poppins, two of my favorites from childhood. Mine are a little young still, but I can't wait to introduce them to Oklahoma, Newsies, and of course, Princess Bride. What movies are you dying to share with your kids? The original Parent Trap!! My sister and I watched it over and over. I don't know if my little boy (1 yr old) will be as excited about it as I was, but I will try when he gets older! the Goonies...Charlie and the Chocolate Factory. Oh and so many Christmas ones! A Christmas Carol, Miracle on 34th St, and mostly A Christmas Story. I LOVE Annie, too. In fact, I got sick of the usual Disney flicks over and over so I pulled Annie and Swiss Family Robinson out one day and let my 4 year old choose. She's asked to watch Annie nearly every day since then. I wondered if I had introduced this movie a little soon when I started hearing her say with attitude: "Alright, who's next?" (Picture the scene where Annie has her dukes up and is defending the dog against the street hooligans.) Also, she started patting her knees and calling out to dogs in the exact same way Annie calls to Sandy when the dogcatcher is trying to take him way. That was fine, but then she started calling people using that format as well. Pretty funny. Willy Wonka (the old version of course), Parent Trap, and Matilda. The King and I. I just watched it, for the first time in decades, with my niece and nephew and they loved it!